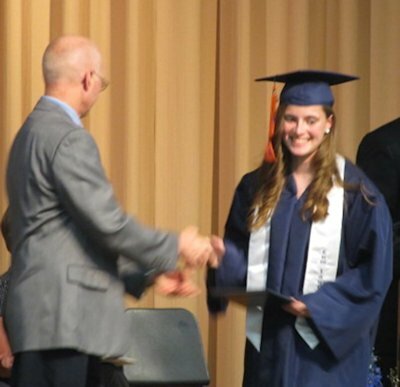 On Sunday, May 19th, 2013 the Illini West High School presented 96 graduates with their diplomas after meeting their graduation requirements. Principal Brad Gooding reminded his graduating seniors that "The world owes you nothing. After today you are just another statistic, a little fish in the big pond of life. Nothing in this world will be handed to you. Nothing will come easy, so it's up to you to take the bull by the horns, and make your life what you want it to be." Gooding asked his students as they go on to keep the lyrics of One Shining Moment by Luther Vandross in mind. "The ball is tipped and there you are, You're running for your life, you're a shooting star, And all the years No one knows Just how hard you worked , But now it shows:In one shining moment It's all on the line One shining moment, there frozen in time But time is short and the road is long In the blinking of an eye, Ah that moments gone. And when it's done, win or lose You always did your best Cause inside you knew One shining moment you reached deep inside One shining moment you knew you were alive Feel the beat of your heart, feel the wind in your face, It's more than a contest, it's more than a race. And when it's done, win or lose, You always did your best cause inside you knew that one shining moment you reached for the sky, one shining moment you knew, one shining moment you were willing to try. One shining moment". "Class of 2013- the ball in the game of life has been tipped, may all of you have many shining moments." In her address to the class, Senior Hunter Doyle noted that many of them will make plans for their future and they will most likely change. As an example, Doyle said "When I was in kindergarten, I announced when I grew up I was going to work at Burger King" as she donned a crown from the fast food restaurant. "Which is fine, but your life has a tendency to change, as mine has changed from Burger King to a career in Optometry." 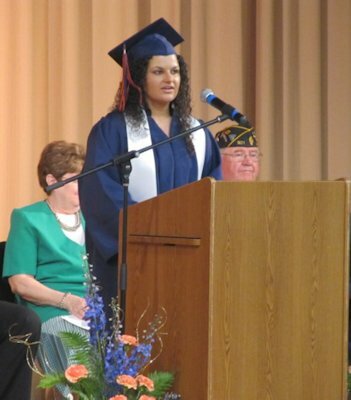 Jessica Fox did a remake of the Fresh Prince of Bel -Air and dedicated it to the Illini West class of 2013. Admittedly embarrassed afterwards, Fox told her classmates they should look back and remember the fun times they had and the memories they share. Fox closed her speech, with one of her favorite quotes, "Whatever you are, be a good one. "- Abraham Lincoln. Morgan Weirather quoted Dr. Suess in her speech to the graduating class. "You have brains in your head. You have feet in your shoes. You can steer yourself any direction you choose. You're on your own. And you know what you know. And YOU are the one who'll decide where to go..."
Alyssa Willey told the class in a quote from Steve Jobs, "Your time here is limited, so don't waste it living someone else's life. Don't let the noise of other's opinions drowned out your inner voice and most important have the courage to follow your heart and intuition. "